Protecting northern Michigan trout streams from the potential threats of oil and gas development will take some watchdogging by a fishing and conservation organization, according to a report commissioned by the group (PDF). The group, Anglers of the Au Sable, has a history of going to court over oil and gas issues. To prepare for what could come next, the group commissioned author and former Muskegon Chronicle reporter Jeff Alexander to investigate gas and oil infrastructure in the region and a controversial method of natural gas extraction that could become more common there. Alexander and Anglers vice president John Bebow are listed as authors, and they explain in the report that it isn’t an “anti-oil industry manifesto.” They keep it from reading like one with multiple statements conceding the importance of the industry in northern Michigan. Yet the report remains a frank assessment of the oil and gas industry’s potential impacts on northern Michigan’s riverine resources. The report gives a lot of attention to a 58-year-old oil pipeline that travels under the Au Sable and two of its tributaries. The pipe is owned by Enbridge Energy, which also owns the pipeline that ruptured in July 2010 and spilled 800,000 gallons of oil into Talmadge Creek and the Kalamazoo River. Yet the report cites eight incidents where problems with Enbridge pipelines have cause millions of dollars in damage and caused two deaths. Also detailed are the severe consequences of a hypothetical spill on the Au Sable. “According to federal government documents obtained by Anglers of the Au Sable, a worst-case scenario could result in a spill of 1.5 million gallons of light crude into the Au Sable River in eight minutes,” according to the report. That’s nearly twice as much oil than what leaked into the Kalamazoo River over the entire course of the spill. 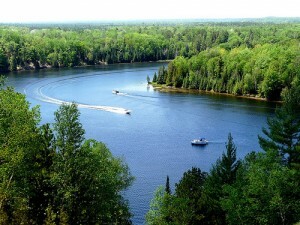 Additionally, the Au Sable’s cold-water ecosystem is more fragile, its fishery is more valuable and its slower flow would take longer to flush the oil out. The report also covered the concern over a potential boom in northern Michigan of a controversial method of natural gas extraction called hydraulic fracturing, or fracking. The method allows drillers to get to natural gas within shale deposits like the Collingwood shale formation that runs through northern Michigan and under the Au Sable. State records show fewer than 10 wells have been drilled into the Collingwood so far and none were within the Au Sable watershed, according to the report. But at a state mineral rights auction in October 2010, an energy company with a history of fracking bought the rights to drill in thousands of acres near the Au Sable and Manistee Rivers. Toxic chemicals: Fracking involves injecting underground at high pressure a slew of toxic chemicals that critics say have the potential to contaminate groundwater or surface water if something goes wrong. Water use: Fracking a well requires an immense amount of water — typically between 3 million and 8 million gallons. The water is permanently removed from the aquifer it’s withdrawn from, either remaining deep underground or trucked off-site for disposal. Regulation: Fracking is exempt from many water protection laws, including provisions of federal Safe Drinking Water Act and a Michigan law that prevents large water withdrawals from harming nearby streams. State officials have said that fracking is safe and well regulated, and that Michigan is well suited for it, according to the report. Officials said the state has high standards for casings that separate wells from the ground they’re drilled through, and a thick layer of rock separates the Collingwood shale from important aquifers. In response to who will pfoirt: roughnecks out of technical schools make starting salaries of 60-80,000/year. Jobs are exploding across the nation. Truck drivers who transport proppant (white sand and water) make anywhere from 60-90,000/year. Investors who want to buy trucks and trailers make HUGE pfoirts while providing more and more jobs for those who need them. The energy industry (especially natural gas companies) are about to explode on the stock market! Absolutely anyone can pfoirt from fracking. In the 60 years it has been used to harvest energy, not one case of water contamination has been reported. The main cause of contamination is a process called enhanced oil recovery or secondary recovery that pumps water at extremely high pressures into shallow coal beds and oil reservoirs. Hydraulic fracturing harvests energy reserves from 8-12,000 feet underground. We should never let down our guard to protect human health and the environment, but Michigan actually has among the most stringent natural gas drilling regulations in the country. That’s why fracking has been safely used for many years on thousands of wells in our state. The documentary “Gasland,” while compelling to watch, also contains a number of inaccuracies, including that drilling caused tap water to become flammable. Scientific research into that issue proved that accusation false. We’re in a very different situation here in Michigan than in other states, as the environmentalists who authored the Au Sable report recognize. Hydro-fracking is a misnomer, the real name given that process should be toxic-fracking. For the sake of anyone not knowing the process, here it is very generally. A lot of natural gas is trapped underground in shale-like rock formations. The cracks in the shale are too small for water to penetrate due to the viscosity of water. Meaning that water/shale combination has the natural gas trapped such that it cannot be extracted by pumping. To extract this gas, a chemical stew is concocted which lowers the viscosity of water and penetrates the shale displacing the gas and leaving behind the chemical stew. The chemical stew then mixes with the natural ground water and poisons it. Once the stew is in the ground water it moves with the groundwater and can move into wells, rivers, lakes, and ponds – poisoning all of these in the process. The movie “Gasland” is a documentary that details the perils of fracking, showing how tap water at the kitchen sink catches fire with a BIC lighter. I like your writing, Jeff, you cover all the bases. I am very concerned about fracking, the lack of accountability and regulation, and the cavalier attitude of the oil and gas drillers. I am afraid we won’t take it seriously until after there is some great disaster.